Temporomandibular disorder or TMD is a broad term referring to problems with the jaws and their functioning. It is commonly referred to as "TMJ".This system is very complex and problems are caused by a variety of factors. This web page will attempt to give you a general overview of TMD so you can better understand the problems you may have been having. The temporomandibular system consists of three basic components; the temporomandibular joint or TMJ, the teeth, and the neuromuscular system. TMJ- This is the term often used to describe TMD, but it specifically refers to the joints that work your lower jaw, or mandible. These two joints are found just in front of the ears. Their close proximity to the ear is why some patients experience ear symptoms and can often hear the joint pop or crack. These two joints never act alone, that is, when your jaw functions, both joints will be working. There is a small cartilage disc between your lower jaw and skull in the joint. Some TMD problems are caused by dysfunction of this disk. When healthy it acts as a sort of "shock absorber" for the joint. Teeth- The teeth are like the third leg of a tripod, the TMJs being the other two legs. The alignment of your bite and the functioning of the TMJs are intimately connected. Problems in any of the three areas may effect the other two. Neuromuscular- This system is the nerves and muscles which work the temporomandibular system. It is important to realize that only the lower jaw, or mandible,moves during jaw function. The upper jaw, or maxilla, does not move; it is firmly attached to the skull. Therefore, the nerves and muscles are involved in moving the lower jaw only. The nerves transmit the messages for the muscles to move the jaw. They also transmit pain signals to the brain causing you to feel discomfort. The muscles are fairly large and are found from the side of your head down to your neck. Other related muscles that do not specifically work the jaw, but are sometimes symptomatic are found in the neck, face, and upper back. Temporomandibular disorders come in many forms and varying degrees of severity. Basically TMD is a problem when you either experience pain and/or a loss of jaw function. The pain can range from a mild ache in the morning to a chronic debilitating pain. Loss of function can be mild jaw stiffness to being unable to open the jaw barely at all. 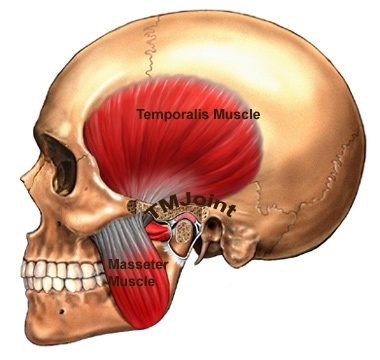 The symptoms of TMD can be an obvious jaw pain in the muscles near the mouth, but can also often exhibit as headache at the temples ("temporal headache"). This is due to inflammation in the large jaw closing temporalis muscle which is on either side of your head. To find this muscle place your hands on your temples and clench your teeth hard and you will feel this powerful muscle contract. Patients often feel this symptom is a tension headache or sinus headache but it can be easily differentiated during a TMD exam. Patients understandably (and many doctors) fail to make this connection between TMD and headaches. The pain of TMD can come from either the muscles or the TM joint itself; often it comes from a combination of the two. The muscles can ache due to causes discussed below. Pain in the joint is usually due to inflammation within the structure itself. Sometimes the symptoms are found in other facial structures; such as dull ear pain, toothache, neck pain, etc. This referred pain is fairly common but it is important to rule out a medical and dental causes of these pains prior to TMD treatment. Loss of jaw function can be due to muscular and/or joint problems as well, just as pain can. The degree to which each is involved is determined through thorough history and exam. Temporomandibular disorders rarely have a single cause. Any one of the following factors may contribute to TMD. Each patient presents with an individual combination of factors that are determined during history taking and clinical exam. Trauma - Acute trauma to the jaws such as a car accident, a fall, a punch, etc. can cause damage to the muscles and/or joint. The acute pain and loss of function is usually responsive to conservative treatment. Sometimes trauma to the joint can cause chronic damage which may eventually contribute to a TMD problem at a later time. Bruxism - Bruxism refers to a non functional grinding and clenching of the teeth. Some do this while awake but more often it is done while sleeping. Most people grind their teeth while sleeping to some degree. For whatever reason some people do this very hard to the point where they wear the enamel from their teeth. This bruxing is done by the jaw muscles and by the morning they can be painful due to fatigue. This constant pressure also can damage the TMJs over time. Bruxism is the most common factor found in TMD. Malocclusion - This term means "bad bite". Sometimes when the teeth do not bite together in harmony with the shape and position of the joints it can place pressure on the joints. Missing teeth can sometimes contribute to this as well. The misalignment can also put strain on the jaw muscles. This factor can be mild to severe. Though the bite is an important part of the whole system it is only altered after conservative measures and only if it is felt improvement will result. 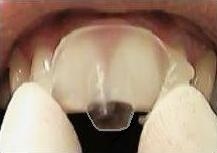 In some patients discrepancies (known as interferences) become apparent after wearing the NTI device for a few months and a bite adjustment is recommended. Treatment of the bite for TMD is usually not needed but its contribution to the whole must be examined. Emotion - Emotional stress often plays an integral role in the development of TMD. This occurs due to two basic reasons. Stress increases both the severity and duration of bruxism while asleep. Also, many will subconsciously clench and/or grind their teeth more while awake during times of stress. The other way stress contributes to TMD is that during times of stress your adaptability and pain threshold will go down. As a result you are more likely to experience symptoms of TMD if other factors already exist (bruxing, joint damage, etc.). Emotional conditions beyond daily life stress can contribute to TMD as well. Depression, anxiety disorders, and the like can often have TMD problems arise. These conditions are quite stressful and it is not hard to imagine why TMD would develop. Ergonomic - Your job and how you do it can contribute to TMD and related problems. If you work at a computer all day, for example, you may be holding your head in such a way that places strain on your TM system. Treatment plans for TMD are as varied as the patients that present with it. Each patient must be treated differently depending on the uniqueness of their problems and the contributing factors. Pain Relief Info. It is very important to realize that the goal of TMD treatment is to minimize pain and establish a return to function. TMD conditions are not "cured" but are managed instead. The basic goal is to allow the muscles and joints to heal through rest and care. Often damage to the joint itself can not be reversed, but the body can often heal it enough to return to function without pain. We also want to teach you to recognize the symptoms early and manage them yourself once we give you the tools to do so. This condition can often recur later on but early care can minimize the severity. The basic philosophy of treatment is to do the conservative and reversible treatments first. Irreversible treatments , such as surgery or orthodontics, are only considered if conservative steps have failed to bring lasting relief. These more radical treatments are rarely used. Most patients respond well to simpler care. The following treatment modalities may be used in each case..
Occlusal Splints - These devices are is designed to protect the teeth from further wear. These also will reduce the severity of grinding at night and allow the muscles to rest. In more severe cases it needs to be worn all day as well to allow the TMJs and muscles to rest. There exist many types of TMJ splints and which type is best depends on each patient's situatiuon. Full coverage traditional splints are useful, particularily in patients with mostly joint dificulties. They protect the teeth from the wear and tear of grinding and help stabilize inflamed and damged TM joints. The NTI Device is easier to wear than traditional night guards for many patients. They are smaller than traditional splints and are designed not to allow the posterior teeth to touch at all. This alignment suppresses clenching over ninety per cent, giving the jaw muscles a break. Also, since the teeth are out of contact no wear occurs. The NTI has also received FDA clearance as an adjunct for the treatment of medically diagnosed migraine pain. Customized NTIs on traditional orthodontic retainers can be made as well. Patients often prefer this design as it has a more stable fit and eliminates any risk of swallowing the device. The NTI-tss system takes advantage of the naturally protective nociceptive trigeminal inhibition reflex which prevents the powerful temporalis muscles from contracting with full intensity. It is the protective reflex experienced when biting down, expecting something soft, but encountering something hard. In addition to preventing occluding of the canine and molar teeth (which is required to generated significant muscle contraction intensity and joint strain) this jaw-opening reflex - triggered by the NTI-tss device - protects incisors, posterior molars, surrounding tissues and the TM joints. Helps prevent associated headaches, stiff, sore joints and muscles, and tooth sensitivity. Jaw Rest - You must rest your jaw for it to heal. The occlusal splint will help somewhat but other steps should be taken. You should not chew gum at all, bite your nails, clench your teeth together while awake, or any other non functional jaw habits (pencil chewing, etc.). Your diet should be fairly soft, avoid chewy and crunchy foods during treatment. Medication - Pain medication can be prescribed. Often over the counter analgesics such as ibuprofen are enough. Sometimes we will prescribe medicine similar to Ibuprofen but a bit stronger. These medications not only relieve pain but reduce inflammation as well to aid in the healing process. Occasionally a mild muscle relaxant may be prescribed. Narcotic medications are not very helpful in treating TMD and are rarely prescribed. Moist Heat - Moist heat is very helpful for the sore muscles of TMD. The penetrating moist heat promotes blood flow into the muscle which aids in healing and relaxation of the muscle as well. This increased blood flow also helps analgesic/ anti inflammatory medications into the muscles. A wet washcloth with a hot water bottle will do, or you can purchase moist heating pads if you wish. Physical Therapy - Physical therapy can help relax the muscles, increase joint flexibility, and the like. It also is very useful in training the patient proper posture and bad habit avoidance.We refer many patients for physical therapy with a provider who has experience and training in managing TMD. Exercises - Some simple jaw and neck exercises which will help the muscles stretch. A good time to do some of these is in the warm, moist environment of the shower or bath, particularly in the morning and/or before bedtime. Click here for some simple exercises. Occlusal Adjustment - We evaluate all TMD patient's bite with the T-Scan computerized bite analyzer. This device shows exact bite forces on each tooth in the mouth during various motions. It allows conservative, effective adjustments to be performed when needed. Bite discrepancies that aggravate TMD symptoms may be corrected through a minor reshaping of the teeth. These usually are diagnosed after wearing the NTI device for several weeks or more. They are discovered when the muscles relax after consistent NTI splint wear. Stress Management - Emotion and stress plays an important role in TMD. TMD may be a sign that the patient is under stress that they are not quite aware of. Anything that helps you relieve stress is helpful, such as reading, exercising, listening to music, and the like. If the stress is getting to be a bit much, counseling is often helpful to learn stress management. Counseling is also recommended if you feel you need help with any emotional problem. It is almost impossible to get relief from TMD if the underlying emotional issues are not addressed. Referral - Specialists may be needed to optimally treat your case. Opinions and/or treatment may be sought from physicians, oral surgeons, orthodontists, psychotherapists, physical therapists, or prosthodontists. Very severe cases may be referred from the start to a pain center or a dentist whose main focus is the treatment of temporomandibular disorders.